Proud new owners Drs. Edison Barrientos, Oscar Albarracin, and Medical Director Dr. Yulien Sun purchased VETS Toronto Kingston Road Animal Hospital this January. Located at Kingston Road and Victoria Park Avenue, the veterinarians are bringing a new approach to the clinic which has a long standing history in the Beach area as the location has been independently owned and operated since 1986. Albarracin, originally from Columbia, now calls Toronto home. He said the clinic’s involvement with the Farley Foundation, which provides help to those who need social assistance, has helped to raise over $10,000 for the foundation over the years through events such as bike rides and races. An Ontario Veterinary College Graduate, Dr. Barrientos, independently founded three clinics. “Part of our role is to educate the client, a big part being advocacy on preventative health,” he said. Pet insurance can be expensive which is why the clinic likes to follow the philosophy that ‘the best insurance is to live a healthy lifestyle’. Sun says with the advancement of human medicine comes more treatment options for animals. She said that “holistic medicine is something we’re offering. I am passionate about traditional Chinese medicine, so I offer acupuncture as a complementary treatment to a lot of Western diseases such as arthritis, cancer, and disc diseases. The last thing you want going through with your older animals is chemicals, so I try to minimize the amount of medication they need through acupuncture,” said Sun, a certified veterinary acupuncturist. 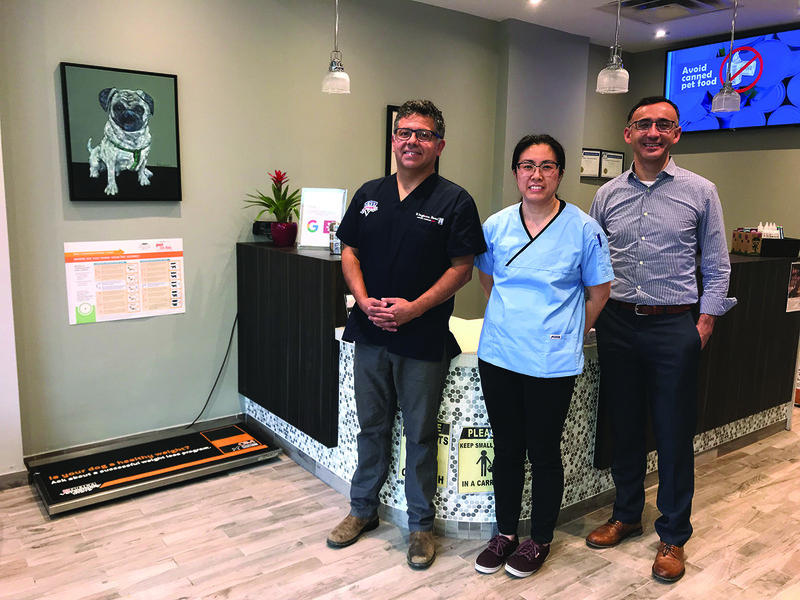 The clinic is looking forward to servicing the Beach, east Toronto, and Scarborough communities by bringing new holistic approaches to veterinary medicine with a renovated facility and experienced staff. They welcome members of the community to tour the facility and personally get to know your pet’s doctors. VETS Toronto Kingston Road Animal Hospital encourages new and existing clients to visit 1025 Kingston Road, or book an appointment at 416-690-0625. Clinic hours are Monday to Friday 8 a.m. to 11 p.m. & 10 a.m. to 10 p.m. on weekends and holidays. For general questions and inquiries send an email to reception@vetstoronto.com.